We believe secure families are the bedrock of society and bring to light the importance of unity in Christian homes. 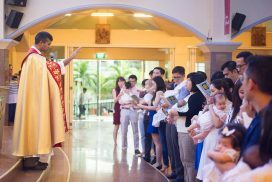 Through the sharing of our own joys and struggles of bringing up our children in a Catholic environment as parents and godparents, we strive to enlighten the families to make disciples of their little ones who will be our church of the future & reach out to families seeking baptism for their young ones. Infant baptism and preparation occur every first and second Sunday of the odd month. “Holy Baptism is the basis of the whole Christian life, the gateway to life in the Spirit and the door which gives access to the other sacraments.